Download Torrent "[alternative folk, ambient, dream-pop] (2018) Anne Garner - Lost Play [FLAC..."
Anticipation has steadily grown in these parts for the follow-up to Anne Garner‘s mesmerizing 2015 release Be Life, and with Lost Play it’s finally here. Many of the qualities that made the earlier release so special are present on the new one, her fifth, which features eight deeply engrossing incantations graced by her inimitable voice. That singular instrument captivates whenever it appears, especially on a representative song such as “Fall Before the Night” when the mix makes it seem like her voice is so close she’s cooing in your ear. Similar to Be Life, Lost Play little strays from its balladic, slow-motion delivery, and her reveries enchant as powerfully on the new set as the earlier one. There is one key difference between them, however, namely a more elaborate approach to arranging on Lost Play. Supplementing her vocals, piano, and flute are contributions from co-producer James Murray (guitar, bass, keys, electronics, vocals), Brona McVittie (harp), Jo Quail (cello), Nick Samuel (saxophone), Maris Peterlevics (violin), and Jack Hayter (pedal steel). During initial run-throughs, some arrangements struck me as perhaps a tad too elaborate and that the material might have been better served by a sparser presentation; put simply, the presence of many instruments seemed to obscure the clarity of the music’s delicate core. Yet with repeated listenings, acclimatization to the denser presentation set in, especially when the fuller sound began to amplify the dramatic weight of the songs and bolster their emotional effect. That said, there’s no question that Garner’s songs wouldn’t suffer if they featured nothing but vocals, piano, and flute; as beguiling as her singing, in fact, is her flute playing, which lulls the senses with its soft quiver. Still, however the songs are presented, they’re transporting vehicles that usher you from this world to another, a magical one filled with mystery and beauty. 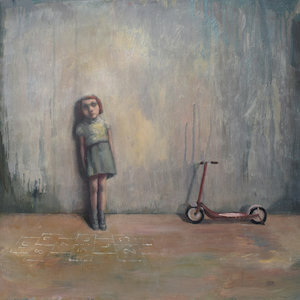 Splendidly captured by Bobbie Russon’s cover artwork, the album’s theme has to do with the gradual loss of innocence and joy that adulthood brings as the carefree realm of childhood moves ever more inexorably out of reach. Conformity and pressures of societal and interpersonal kinds take their toll as our natural openness to uncorrupted, childlike pleasure retreats from view. Garner’s album accentuates how great that loss is and how replenishing reclaiming even the smallest part of it can be. Strings and harp form a perfect complement to her hushed voice in the opening “The Living,” which takes mere moments to work its magic and cast its uplifting spell, and at this early juncture we’re reminded of the remarkable quality of her singing as the meditation’s melodies unfurl and the song’s hypnotic net casts wide. Certainly two of the album’s standouts are “Colt” and “Not Home,” soothing lullabies that, buoyed by beautiful melodic progressions, prove enrapturing, whereas a mid-album peak is reached with the title track when her vocal delivery and a melancholy melodic design combine for the album’s most poignant performance.